This IBM Redbooks publication is designed for IT architects and IT specialists that are dealing with IBM WebSphere Message Broker and IBM WebSphere Enterprise Service Bus (ESB) solutions. 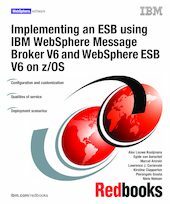 This book illustrates how to configure an ESB using either IBM WebSphere Message Broker V6 for IBM z/OS or IBM WebSphere Enterprise Service Bus V6. It makes various traditional z/OS transactions and data available as a Web service through the broker, including IBM DB2 data, batch programs, and IBM CICS/IMS transactions. In this book, there is more focus on WebSphere Enterprise Service Bus installation and customization than on WebSphere Message Broker because the latter has already been documented in other places. This book describes multiple scenarios that show how to integrate applications using a mix of MQ and SOAP protocols using both Advanced ESB, also known as WebSphere Message Broker, and WebSphere Enterprise Service Bus. High availability using clustering of brokers in multiple logical partitions (LPARs) on z/OS is also addressed in this book, with details on which feature you can use and configure to improve continuous operation, such as shared queues, shared ports, and Sysplex Distributor.